Last week I talked about my shopping trips and what its like to shop with 4 kids. 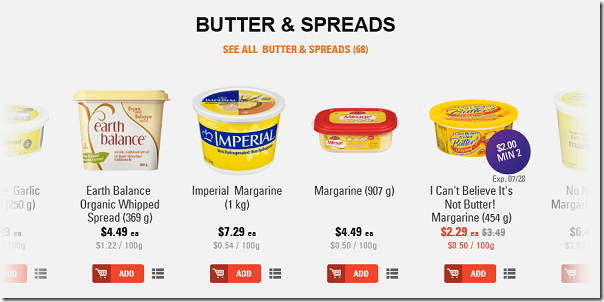 When I learned about Loblaws Click & Collect (shopping online) service I wanted to try it. The closest store that had it available was 40 minutes away so although I didn’t get to try it myself, I sent my reviewer out to try it, Barb. Disclosure: I am a P&Gmom ambassador. As part of my affiliation with this group I have been compensated to test the Loblaws Click & Collect service. The opinions on this blog are my own or my reviewers. To order you go to shop.loblaws.ca or shop.zehrs.ca depending on what the participating store that’s near you is. All quotes are from Barb. It was pretty easy to select the department you want. You can look at the whole section (say dairy and eggs) or go directly to a more narrow search. I could easily see what was on special as the sale price was in red. It even showed the regular price and how much you saved. Being my first time and not having a specific list it took me a while to search around. As I (Kathleen) searched around the site to see what it’s like, I noticed you could also shop by popular brand and it showed real images of the items which was nice. I also noticed that for a limited time if you buy a Pampers product they will waive the Click & Collect fee (more on that later.) I thought that was a nice promotion. It seemed that Barb had some trouble with the sign in but when I tried, I was fine. I think it’s because she signed in first whereas I didn’t sign in till I was ready to checkout. So you might want to consider doing that too. It was a pain to have to sign in every time I did something. I signed in then when I selected a flyer I had to sign in again. Then I had to choose the store location and sign in once more. The check out was a bit confusing as to where you clicked to continue. I really did not like that I could barely read the headings when filling in credit card info. I didn’t continue all the way so I can’t speak for the final checkout. It sounds like they just have some tweaking to do with the system. There are a couple stipulations. You must spend at least $30 to use the service and there is a $3 pickup fee (or $5 if you want to pickup between 5-7pm). You have to enter your credit card info online when ordering but you can choose to pay other ways when you get to the store such as debit or cash. You can pick a pick-up time in the future from about a few hours to days later. 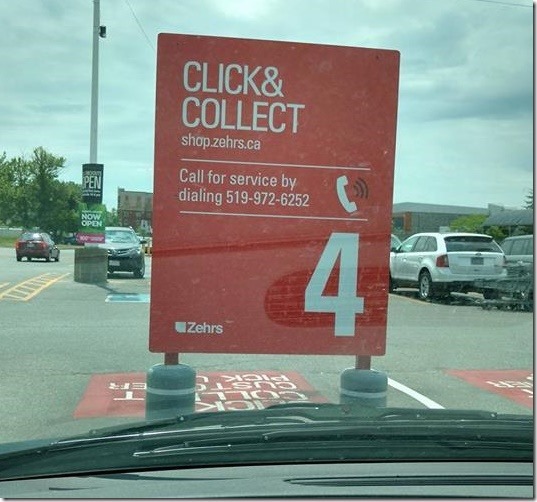 When you go to pick up, there is a completely separate section for the Click & Collect and you park in one of their spots and call their number (so you’ll need a cell phone.) They bring your order out to your car AND put it in the car for you! Barb was very pleased with customer service. She asked a few questions and they had no problem explaining how things worked. She asked how they kept her frozen items cold when they had a 2 hours span for her to show up. She was told they have a separate room with a freezer and an oven to keep cold foods cold and hot foods hot until you arrive. The Click & Collect workers (who work solely for that service and wear special shirts) said they have about 100 customers who use their service which is pretty good since it’s a new service in this store. and any number of things. and inputting your postal code. It will show you local stores. If you’ve tried it out, let me know. If not, tell me if you think you’d like to try it.